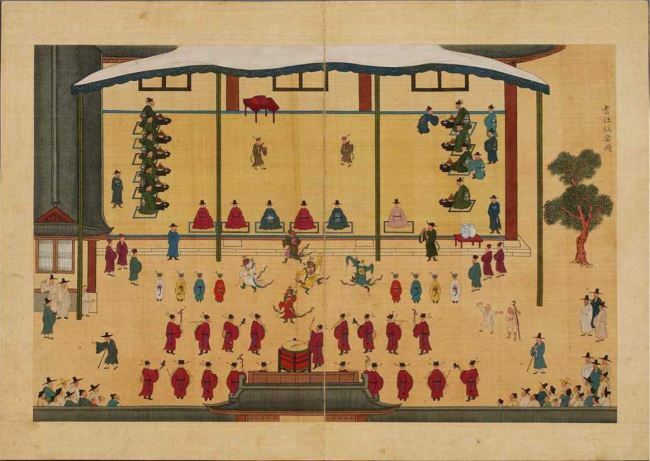 An 18th-century collection of works that includes a historic painting depicting events at the Joseon Dynasty royal court is slated to become one of South Korea’s national treasures, the Cultural Heritage Administration announced Thursday. The “Gisa Gyecheop,” or “Album of Paintings of the Gathering of Elders,” is to be promoted to national treasure status after 30 days of deliberation by the Cultural Heritage Committee and feedback from experts. The work is currently Treasure No. 929. The 50-page album of pictures and writings was commissioned by the royal palace in 1719 and completed by court painters the following year. It was created to commemorate 59-year-old King Sukjong’s admittance to the Gathering of Elders, an honor normally reserved for senior civil servants who had reached the age of 70. An exception was made for the king, however, in consideration of the fact that Joseon Dynasty founder King Taejo had gained admission at 60. The album consists of a painting depicting the celebration that marked King Sukjong’s entry, portraits of the 11 other senior civil servants who belonged to the Gathering of Elders, and congratulatory poems dedicated to the king. According to the Cultural Heritage Administration, the painting is regarded as one of the Joseon royal court’s highest-quality works, having drawn praise for its vivid colors, delicate painting techniques and realistic use of shading. Its study is essential to a thorough understanding of Joseon Dynasty painting styles. The culture body said the painting’s condition and quality had influenced the decision to designate it as a national treasure. Cultural heritage items that the Cultural Heritage Committee deems extremely valuable to humanity are designated treasures. Rare treasures with exceptional historical significance are promoted to national treasure status.